View of the Lowdore Waterfall and Keswick Lake (in fact this is Derwent Water) in an area known as the Lake District in Cumberland, England. The waterfall is situated three miles from Keswick and because of its beauty is sometimes known as the Niagara of England. 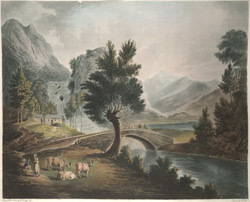 The stream of Lowdore runs through a chasm and is bounded by large boulders, the waterfall has a height of approximately 150 feet and was a popular subject for 18th and 19th century landscape artists.